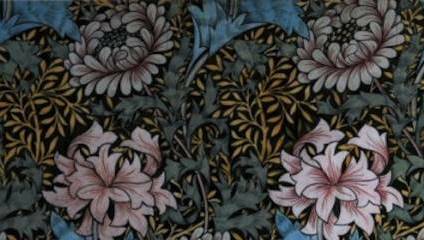 William Morris is most famous for his beautiful designs, inspired by the aesthetics of nature. He was a dedicated socialist and writer, and lead proponent of the Arts and Crafts movement. He also wrote prose and poetry: his novel ‘News from Nowhere’ was published in 1890 and is a work of science fiction in which he describes a socialist utopia. Morris lived in Walthamstow from 1848 to 1856, along with his mother and six siblings, in a Georgian house built in the 1740s. The building became a gallery dedicated to Morris in the 1950s, and was completely refurbished in 2012, adding additional wings and a tearoom. It hosts a range of displays, and ephemera from Morris’s life, as well as exhibitions on subjects related to Morris, from their current display on the life and work of Morris’s daughter May to African textiles, political posters, and the history of Walthamstow’s art scene. The building explores the life of one of Britain’s most ambitious and talented artists, allowing visitors a closer look at his designs, and further information about his life. The gallery situates Morris in amongst his contemporaries, demonstrating how collaboration and idea-sharing was paramount in his working practices and the development of his style. As a young man, Morris befriended Edward Burne-Jones, who became a student of Dante Gabriel Rossetti. Through these individuals, Morris became interested in the Pre-Raphaelite movement - who currently have an exhibition on at the National Gallery - the group of artists who looked back to medieval techniques, encouraged the close observation of nature and moved away from the stilted and posed expressions of the Mannerist artists. Morris was particularly interested in medieval history, and wanted to return to the skilled work of medieval craftsman. The Arts and Crafts movement flourished in the UK from 1880, inspired by both Morris and philosopher and writer John Ruskin. For any fan of Morris’s beautiful designs, this museum provides plenty of examples of his tapestry and tile designs, as well as sketches and preparatory designs. Many of the objects on display demonstrate Morris’s enthusiasm for craft and design. His ‘Woodpecker Tapestry’ from 1885 for instance is a beautiful example of his technical ability – he taught himself how to weave – but also his interest in replicating historical design, inspired as it was by medieval art. Burne-Jones became the lead designer of stained glass of the age, and many of his works are also on display, including tile designs and drawings. His tile design ‘Beauty and the Beast’ from 1863-4 is a testament to the collaboration implicit with Morris’s company, with additional design work by Morris himself and Lucy Faulkner, the sister of one of Morris’s business partners. Image credit: Battye Embroidered Wall Hanging (c.1900) designed by May Morris. Donated by Miss M Audrey Battye and Mrs Bibby. The gallery also emphases the importance of Morris’s political beliefs in his practice and his life. At age 49, Morris became a socialist, and these beliefs became paramount in his life and work from then on. He joined the Democratic Federation, Britain’s first socialist party, and campaigned for the rights of workers, improved housing for the poor, and international military intervention. The gallery regularly hosts events inspired by Morris’s beliefs, as well as making workshops for children and adults. This gallery highlights Morris’ sheer ambition, and his undoubted skill and talents for design and craft. It provides a wonderful opportunity to get close to his designs, as well as learning more about a pioneering artist. William Morris Gallery is in Lloyds Park in Walthamstow.